Our zmanim data will enable you to create piece-of-cake shul schedules & marketing materials—for as low as $20. Which package meets your needs? Why order a MyZmanim spreadsheet? Plodding through 365 days of zmanim takes time—time you don’t have. With one order, get back 10 hours of your life—and your sanity, for less than it costs to fill up your tank. Running a nonprofit means there’s never enough cash. With our streamlined system, you can enjoy a silver-platter spreadsheet at a price that makes your board members grin. When people are relying on your zmanim to keep halachah, you can’t afford the risk of human error. Enjoy peace of mind, knowing that your calculations are automated—and that your halachic times come with MyZmanim’s relentless commitment to reliability. Browse spreadsheet packages and order the one that suits your needs. Packages cost as low as $20! You’d like to schedule minchah 20 minutes before sunset, and a Daf Yomi shiur an hour before that. Watch our greenhorn-friendly video tutorial below to learn how to generate the columns you need—in seconds! Your times are ready to go! 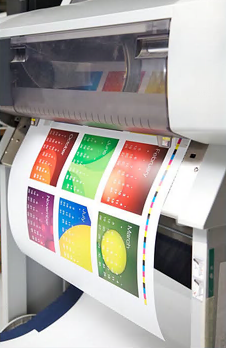 Paste them into your calendar template, import them into Adobe InDesign Calendar Wizard, or hire a graphic designer to create a magnet that will wow donors and woo prospects. 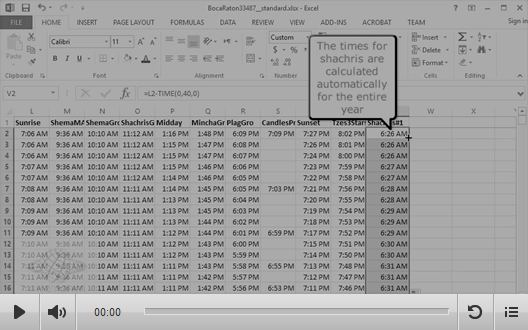 Want to see the spreadsheet created in this video? If you have a programmer on staff (or just an aspiring techie), here’s some good news: our zmanim spreadsheets can be easily imported into MS Access or other database software, and included in your applications. To see a sample, download this Access database and double click "Boca Raton." For a fully integrated solution, check out our robust Developer API. MyZmanim unites an entire nation, providing every Jewish person with up-to-date, detailed zmanim info for millions of locations worldwide.